Mammoth head-type Time Shifter that can freeze anything (whatever form he was in). 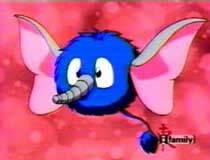 Mosbee-Con is a real woolly mammoth and has a club attached to his trunk which fires the Petra-Freeze attack. Mosbee-Master can freeze anything from his ears. He was found in Russia when Napoleon Bonaparte invaded the country.